Following his service in World War II, York boy Eddie Barron returned to the Perth suburb of Midland. In the immediate postwar years he became a noted sprint rider under Swansea's sponsorship. His talents were not limited to the track though, in the first postwar Beverly to Perth race, a gruelling 116 mile ride, Barron turned in the fastest time of 5 hours 17 minutes. Across the street from the old track in Midland was Ajax Cycles, which came up for sale. 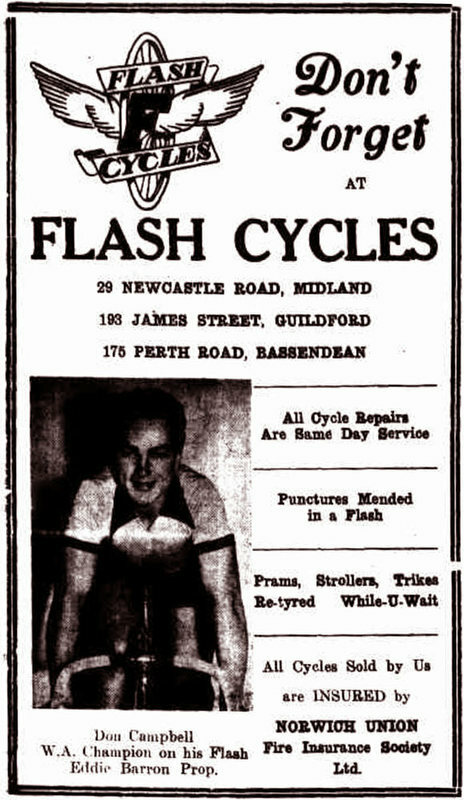 Eddie bought the store in 1949, changed the name to Flash Cycles, and proceeded to become one of Australia’s greatest cycling boosters. Eddie promoted races on the road and at the track. He ran the old Midland Cycling Club (founded in 1899) for decades, and put up prize money for local races. While employing local cyclists to work the front of his shop, Eddie brazed wonderful racing rigs with his lightning bolt emblem in the back room. Today, one of the finest velodromes in the world is the Perth SpeedDome. The SpeedDome arena covers a 250 meter track made from Siberian pine, and is located on Eddie Barron Drive in Midland. Flash frame numbers are often stamped on the seat cluster - the area where the top tube, seat tube and seat stays meet. Other possibilities are the rear wheel dropouts and under the bottom bracket. Have you got some pics online? Post the link here. Your first name may be published.